Kim Philby was the greatest spy in history, a brilliant and charming man who rose to head Britain's counterintelligence against the Soviet Union during the height of the Cold War - while he was secretly working for the enemy. And nobody thought he knew Philby like Nicholas Elliott, Philby's best friend and fellow officer in MI6. The two men had gone to the same schools, belonged to the same exclusive clubs, grown close through the crucible of wartime intelligence work and long nights of drink and revelry. It was madness for one to think the other might be a communist spy, bent on subverting Western values and the power of the free world. But Philby was secretly betraying his friend. Every word Elliott breathed to Philby was transmitted back to Moscow - and not just Elliott's words, for in America, Philby had made another powerful friend: James Jesus Angleton, the crafty, paranoid head of CIA counterintelligence. Angleton's and Elliott's unwitting disclosures helped Philby sink almost every important Anglo-American spy operation for twenty years, leading countless operatives to their doom. Even as the web of suspicion closed around him, and Philby was driven to greater lies to protect his cover, his two friends never abandoned him - until it was too late. The stunning truth of his betrayal would have devastating consequences on the two men who thought they knew him best, and on the intelligence services he left crippled in his wake. Friends: noun, general slang for members of an intelligence service; specifically British slang for members of the Secret Intelligence Service [or MI6]. If I had to choose between betraying my country and betraying my friends, I hope I should have the guts to betray my country. Such a choice may scandalize the modern reader, and he may stretch out his patriotic hand to the telephone at once and ring up the police. It would not have shocked Dante, though. Dante places Brutus and Cassius in the lowest circle of Hell because they had chosen to betray their friend Julius Caesar rather than their country Rome. The retelling of Philby's activities is so entertaining that I had to keep reminding myself I was reading a work of non-fiction and not the latest John Le Carré thriller (who, incidentally, knew the parties involved in the Philby affair and wrote an afterword). The understanding MacIntyre displays of the British intelligence community gained through his many years researching the subject adds a layer of insight that kept me riveted. (Reviewed by Kim Kovacs). 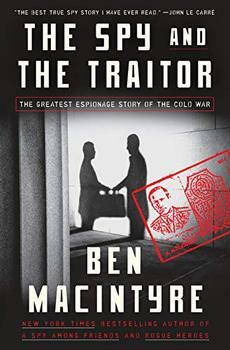 Ben Macintyre has written an engaging book on a tantalising and ultimately tragic subject. If it starts as a study of friendship, it ends as an indictment. Macintyre's focus on friendship brings an intimacy to this book that is missing from the cardboard stereotypes that populate spy novels and conventional espionage histories…I'm not a lover of spy novels, yet I adored this book. Macintyre writes with the diligence and insight of a journalist, and the panache of a born storyteller, concentrating on Philby's friendship with and betrayal of Elliott and of Angleton, his pathetically dedicated admirer at the top of the CIA. A Spy Among Friends, a classic spookfest, is also a brilliant reconciliation of history and entertainment. Other books on Philby may have left one with a feeling of grudging respect, but A Spy Among Friends draws out his icy cold heart…This book consists of 300 pages; I would have been happy had it been three times as long. To read A Spy Among Friends is a bit like climbing aboard a runaway train in terms of speed and excitement – except that Macintyre knows exactly where he is going and is in total control of his material. Philby's story has been told many times before...but never in such exhaustive detail and with such panache as in Ben MacIntyre's brilliant, compulsive A Spy Among Friends. Starred Review. Entertaining and lively, Macintyre's account makes the best fictional thrillers seem tame. Starred Review. Gripping and as well-crafted as an episode of Smiley's People, full of cynical inevitability, secrets, lashings of whiskey and corpses. Ben Macintyre has a knack for finding the most fascinating storylines in history. He has done it again, with this spellbinding tale of espionage, friendship, and betrayal. Written with an historian’s fidelity to fact and a novelist’s eye for character, A Spy Among Friends is one terrific book. Several men have worked for the British Intelligence services and have gone on to have successful writing careers.